New York-raised, world-traveled vocalist Kavita Shah has created a rich personal style informed by her study of the vocal traditions of several corners of the world, including Brazil, West Africa, and the India of her heritage. DownBeat’s Best Jazz Vocalist in 2012, and winner of the ASCAP Herb Alpert Young Jazz Composers Award in 2013, she has since released the acclaimed 2014 albums Visions and, this year, Interplay. 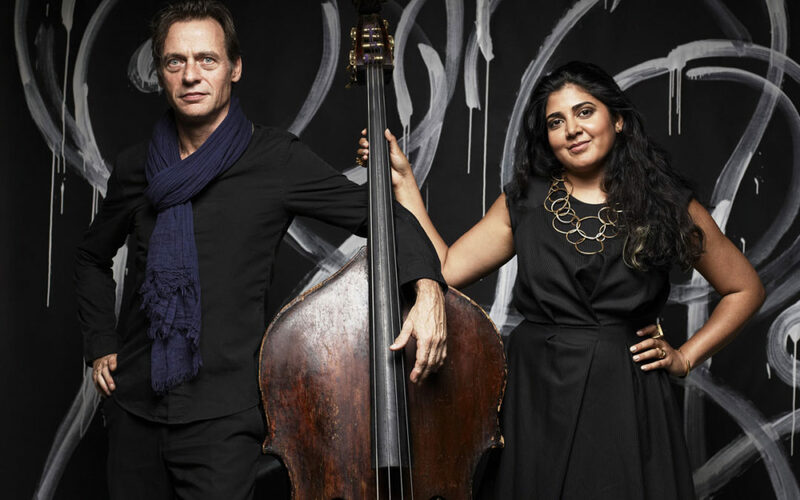 She appears here with New York-based French bassist, her collaborator on Interplay, Francois Moutin, who is not only highly accomplished in bass performance, but also schooled in arcane physics and mathematics (but that—his earning a Ph.D. in physics at the age of 24—is another story). A much-in-demand bassist who has performed and recorded with Rudresh Mahanthappa, Michel Portal, Frank Wess, Jan-Michel Pilc, Franco Ambrosetti, and many others, in 2005 Moutin won a leading French jazz award together with his twin brother and frequent musical collaborator, Louis Moutin, a drummer. Interplay demonstrates what you can expect from them in their early-start (6pm) Seattle concert: enchanting renditions of standards like “You Go to My Head” and “Falling in Love,” as well as originals and interpretations of songs from some of the traditions Shah has studied. On Visions, Shah announced her arrival with a bold first track: a rendition of Cape Verdean vocalist Cesária Evora’s mournful, signature evocation of loss, impermanence, and persistence, “Sodade.” For their setting of it, she and Loueke deployed tabla, kora, Latin percussion, violins, and bass. The result was a fresh, wispy sonic cloud that hovered over a seaspace of North, South, East, and West. Where Shah had, on Visions, accompaniment from 13 musicians from around the globe, on her new release, Interplay, she is alone with Moutin, other than for guest appearances by pianist Martial Solal and NEA Jazz Master Sheila Jordan, Shah’s mentor. The predominant duo setting creates engaging immediacy, and that provides a preview of what to expect at their Royal Room performance. Shah is nothing if not expansive in her artistic ambitions. She displays a winning compositional sense in her singing, and clearly in her song cycle for seven voices, Folk Songs of Naboréa, premiered in New York in 2017, which moved Nate Chinen to place it on his NPR Top 10 Jazz Performances of the year. Shah became interested in jazz as a result of living in Manhattan next door to saxophonist Patience Higgins, with whom she later performed. At first, however, she studied classical piano, and sang a variety of styles of music in the award-winning Young People’s Chorus of New York City. She then studied at Harvard University, pursuing her interests in Latin-American literature and music. She researched Afro-Brazilian music and politics, with fieldwork in Brazil, and won a Harvard thesis prize as well as another for artistic accomplishment. She went on to a graduate degree in jazz voice from Manhattan School of Music, and continues to study voice and composition. Shah has by now performed with musicians around the world. In addition to Loueke and Jordan, she has collaborated with the likes of saxophonist Greg Osby, Indian percussion masters, “Ethio-jazz” founder Mulatu Astatke, and Malian kora master Yacouba Sissoko. When at home in New York, she leads a Brazilian trio, a jazz quintet, and the 13-piece 3rd World Orquestra for tabla, kora, rhythm section, and strings. She has premiered many works for chamber groups, big band, and jazz philharmonic. Tickets are $16 adult, $14 Earshot members and senior citizens, $10 students and military and are avaialble at earshot.org.